Amazon RDS creates a storage volume snapshot of your DB instance, backing up the entire DB instance and not just individual databases. Creating this DB snapshot on a Single-AZ DB instance results in a brief I/O suspension that can last from a few seconds to a few minutes, depending on the size and class of your DB instance. Multi-AZ DB instances are not affected by this I/O suspension since the backup is taken on the standby. When you create a DB snapshot, you need to identify which DB instance you are going to back up, and then give your DB snapshot a name so you can restore from it later. The amount of time it takes to create a snapshot varies with the size your databases. Since the snapshot includes the entire storage volume, the size of files, such as temporary files, also affects the amount of time it takes to create the snapshot. You can create a DB snapshot using the AWS Management Console, the AWS CLI, or the RDS API. 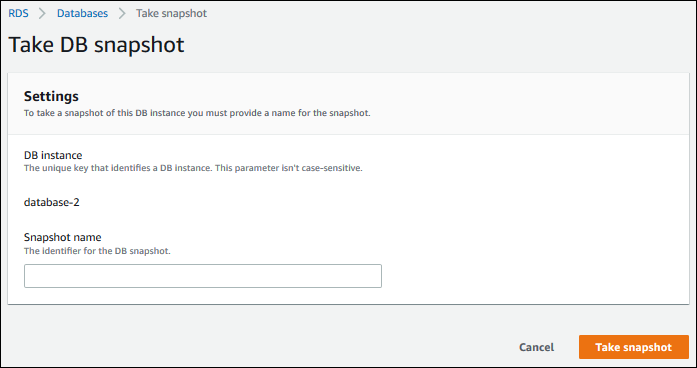 In the list of DB instances, choose the DB instance for which you want to take a snapshot. For Actions, choose Take snapshot. The Take DB Snapshot window appears. Type the name of the snapshot in the Snapshot Name box. In this example, you create a DB snapshot called mydbsnapshot for a DB instance called mydbinstance.